It was so nice to meet our new customers and see familiar faces last week at CSA pickup. We have had so many changes to the farm this year it's hard to pick just a few things to talk about in the newsletter. We want to tell you about ALL of the wonderful things that are happening. But let's start one at a time. Digital versions of this newsletters will have clickable links, and you can find this link on our website navigation bar. Log in, and shop! The online store will be disabled at 8pm Monday, and come up again the weekend before the next week when we know what will be available. As we roll this feature out, we ask for your feedback so we can make it better. In short, in the state of Montana we cannot sell ANYTHING as “ready to eat” without a commercial kitchen. We actually like this law as it also protects us. 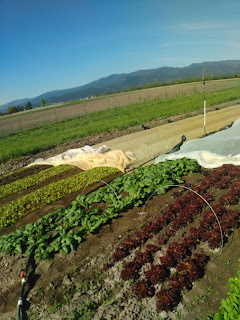 We grow over 80 crops for CSA and this year we are expanding our culinary herbs, micro greens and salad greens to sell to local restaurants and small local grocery stores. We are always extremely careful and diligent about food safety and perhaps even more so because we are carving out a specialty in the market for greens. So, yes, your produce is harvested with care, with clean hands and knives, it is cooled in our walk in and then 'hydro-cooled' in cold well water and spun dry in our greens spinner, packed immediately, and put back under refrigeration. Feel free to ask us if you have any further questions about washing and cleaning your produce. 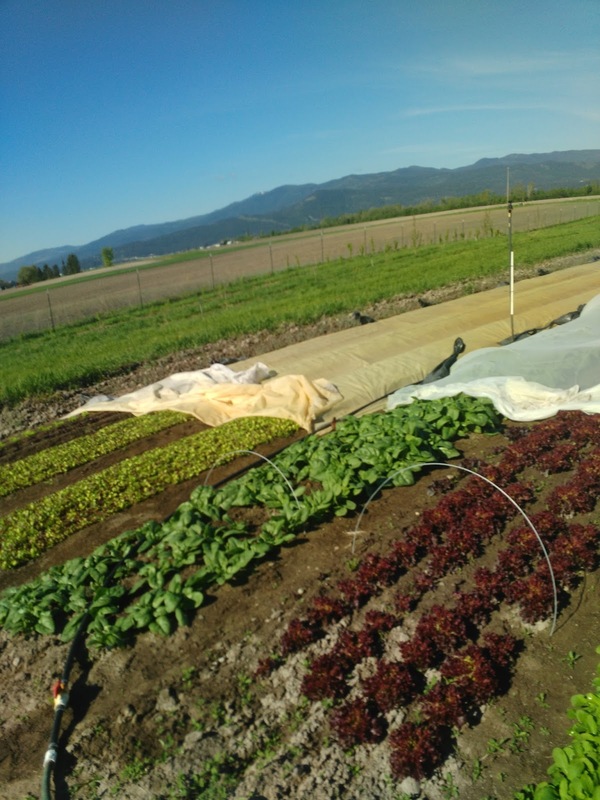 In addition to being physically clean of dirt the produce is 'clean' of synthetic pesticides, herbicides, and fertilizers AND this year we are in the process of getting certified organic. We are currently on step 2 of 3 in the process. We have used organic practices from the beginning and we are happy to further support our organic farming community by officially joining the seal of approval national organic standards. We keep your veggies cool and out of the sun when harvesting, packing, and delivering them to you. Then it's up to you to store them well until you use them. When people ask 'how long will this lettuce last' I know it should/could last two weeks, but who keeps it that long? Fresh is best! Also, your veggies will keep really well if you get them home and put them in your fridge. If you forget them in your car with the windows rolled up...they are only going to last a few hours. If you know you are running errands or going out after CSA pickup it's a good idea to have a cooler or insulated bag for your veggies. 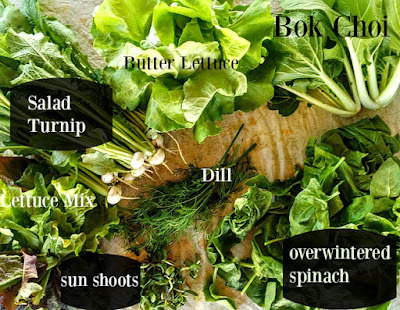 Your fridge will QUICKLY dry your veggies out leaving them wilted and sad. A bok choi in the fridge crisper without a bag will stay crisp a day or two; in a bag it will be fresh for weeks. One of the things we love about CSA is that we can use less produce packaging than at market. In our home we really love re-usable produce bags. If you purchase some of these you can keep them in your insulated bag and take your beautiful bok choi straight out of our csa box and into a bag to take home and put in your fridge. You can also re-use plastic produce bags to keep your veggies in. Salad Turnips – These tasty little Turnips are such a treat to eat. Just slice them up and eat them like a radish. You can also lightly saute or roast them; we like them best raw. They are simply delicious. Turnip Greens – These just happen to be the most beautiful turnip greens I've ever seen. If you've had them before and didn't like them give them a try! Our favorite way to cook bitter greens is to chop them up very small, saute an onion in a hot skillet with plenty of cooking fat, add the finely chopped greens, cook for about 3 minutes and add balsamic vinegar for another minute or two. Great as a side dish. It looks like a lot of greens but they will cook down leaving you wishing there was more. Butter Lettuce – This is hands down the best lettuce of the year. The big leaves are perfect for wraps. We ate three heads for lunch today using the butter lettuce in place of taco shells with ground beef, cilantro, shredded radishes, and sun shoots….delicious! Bok Choi- this is OFFICIALLY our first time ever putting bok choi in the shares two weeks in a row. “the plan” was to have tatsoi last week, bok choi this week, and napa cabbage next week. Slugs ate the first round of tatsoi and the napa is going to be a while; things don't always go as planned. It's a great chance to try another recipe from https://www.earlymorningfarm.com/bok-choy/! Dill-we love using dill for salad dressing. 1 cup yogurt, 1T apple cider vinegar, salt, and dill. Blend. Hope you all have a great week and enjoy the sunshine!